29 Jul An Exciting, MAGICAL Week Ahead! growing in our shop right now. 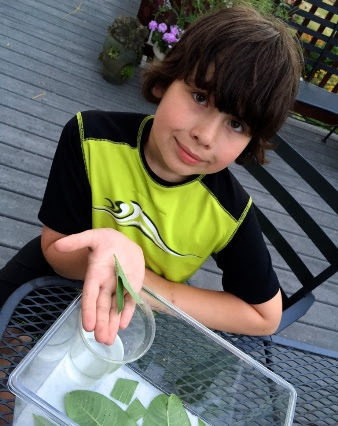 Just in two daysalone while I was in England, Diane and her son Henry collected 86 eggs and two tiny caterpillars. Since 2 of every 100 eggs live to become a butterfly, Diane brought ALL of them into Natureworks to raise them. 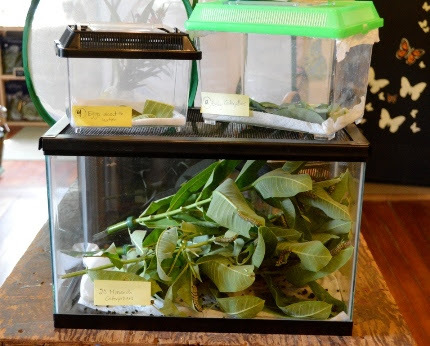 Every single day since, my staff has been collecting more eggs and caterpillars. It is an astounding operation that they are running- cleaning the paper and adding fresh milkweed twice a day. Diane will also tell you all about the plants you should have in your yard to support the monarch population- both larval and nectar plants. 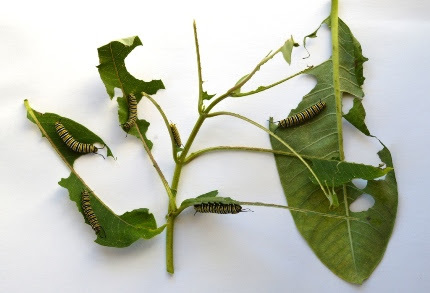 We are harvesting tons and tons of milkweed leaves to feed our hungry monarch butterfly caterpillars. 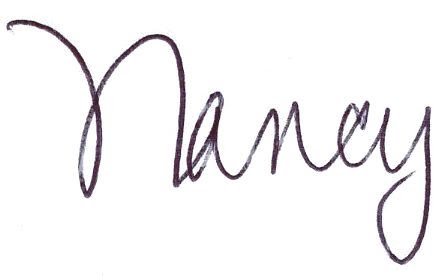 Come visit and see the magic happen before your eyes! Join me Saturday for a potluck lunch and I will tell you all about my English Garden Tour. will have already seen tons of photos. Please call if you are planning to attend the potluck so we can be sure to have enough tables set up. 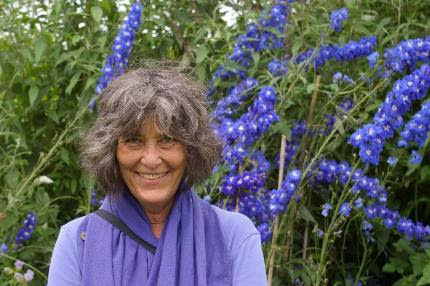 It will be fun to share my experiences in “horticultural heaven” with you! I will tell you about the plants I saw, the design ideas I learned, and the many garden techniques that I observed. What a great way to spend a summer afternoon…. My veg garden this week. Notice there are quite a few empty spaces. Some have been planted with seeds, others are waiting for seedlings and seeds of fall crops such as escarole, celery, lettuce, and late beans. Just keep planting! My garden is surrounded by pollinator plants such as the mountain mint (Pycnanthemum muticum) in the foreground. The goldfinches LOVE the self-sown sunflowers which are the size of small trees at this point. am, I planted the seeds of carrots, baby turnips, scallions, and beets (in accordance with the moon phase). We have completely restocked our seed racks with veggies that you should be planting NOW and throughout early August for fall crops. Our organic veggie seedlings will be here in about two weeks. We will be sure to let everyone who has ordered veggies before know when they arrive. We expect to have all kinds of lettuce, kale, broccoli, Brussel sprouts, spinach, and all the rest of the second season crops. My trick is to plants seeds AND plants at the same time to double the harvest. I expect to be picking fresh food into November again this year. I have been harvesting my ripe elderberries now for a few days. I share them with the birds- we both get to take advantage of these nutritious fruits. 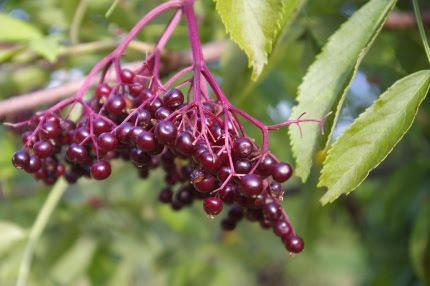 We sold so many elderberry plants over the past few years, many of you must be starting to harvest too. 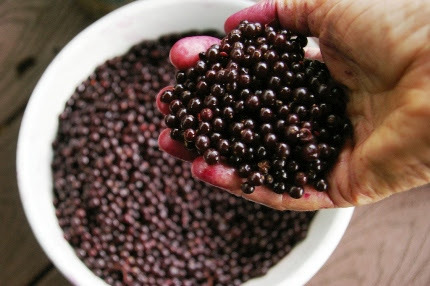 If you don’t have time to make syrup (or elderberry liquor), pull the berries from the stems, lay them on a cookie sheet, and put it in the freezer. In a few hours, move them from the cookie sheet to freezer bags or containers and label them. In the winter (or when you have more time) you can take them out and make the syrup that is so important to build your immune system during flu season. Last year we had a workshop on making the syrup- there are many excellent recipes online. Terri Cusson, who taught the workshop, also made elderberry Jello which was surprisingly delicious! 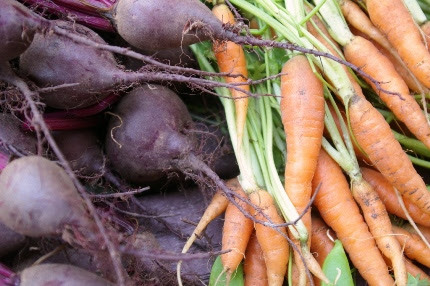 Be creative with your harvests and save all that you can for the winter months when you will be craving your home-grown food. If you don’t have elderberries, blueberries, raspberries, or other fruits growing in your gardens, come on in and pick up some plants. We have plenty! Because of the extended heat wave and erratic rainfall (some towns got a lot and some-like my town- got none), I have been paying particular attention to deep soaking newly planted trees, shrubs, and perennials. It is fascinating to ask my staff which plants do perfectly well in this weather with NO supplemental watering. 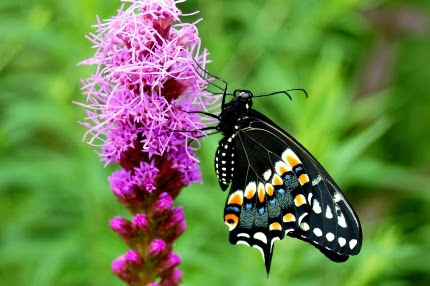 Liatris is a native perennial that can tolerate heat and drought, beloved by all butterflies. A good cut flower too! Liatris tops the list, along with balloon flowers (Platycodon) and butterfly weed (Asclepias tuberosa). These work well because they have swollen roots that store water in dry spells. Russian sage (Perovskia), bronze fennel, Baptisias, and most of my hostas show no signs of drought or heat stress. 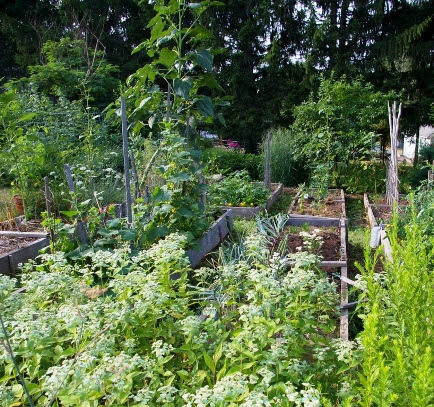 Herbs like lavender, Artemesias, Agastache, and culinary herbs are all fine as well. Sedums, Gaura, blackberry lily (Belamcanda), rattlesnake master sea holly (Eryngium yuccifolium), and Oregano ‘Kent Belle’ are all perky and pretty too. I can see the summer season changing as I drive around. Back-to-school ads play on the radio in the background as I notice Ironweed (Vernonia noveboracensis) starting to flower in the wet fields and meadows. Vervains are another native wildflower I am starting to see on the side of the road, along with woodland sunflowers. My rose of Sharon is magnificent this year. This tree is often referred to as “the last rose of summer” although it certainly isn’t a rose at all, it is in the Hibiscus family. Speaking of Hibiscus, perennial Hibiscus plants are starting to pop with their enormous, dinner-plate sized blooms. Butterflies abound, not only our beloved monarchs but also lots of yellow swallowtails. 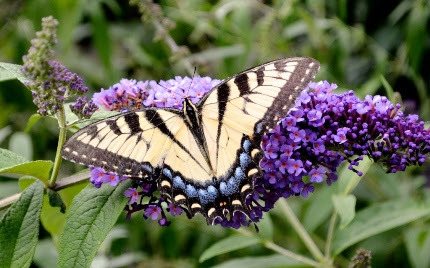 My husband and I watched two of them nectaring endlessly on the butterfly bush next to our deck as we relaxed last Sunday afternoon before dinner. I have holes in my gardens and containers, mostly as a result of plants that I have cut back after they were done blooming or expanses of green foliage, late perennials still to bloom. I am supplementing with fresh color– some new perennials and a large container filled with annuals and tropicals (which I intend to move around wherever I need it). I am sure you too can find a few places to pop in a spot of color or two. We have fresh plants arriving this week, and every week, throughout the summer. Natureworks is brimming with blooms and alive with hummingbirds, bees, and butterflies. The magic is right here- come visit this week and experience it yourself!